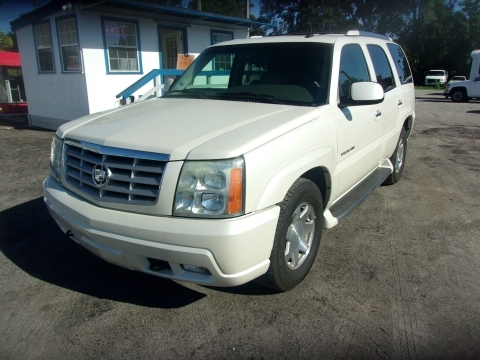 Description: 2003 Cadillac Escalade Luxury 4D SUV. 83,753k miles, 5.3L 8 Cylinder, 2 Wheel Drive Automatic, Loaded to include drivers and passenger power seat, AM/FM/CD/Cass Stereo, Tow Package, White Diamond Pearl Exterior with Ebony and Shale Interior. Any questions call John at Arlington Auto Sales 904-724-0444 and visit our website at www.arlingtonautosales.com to view the rest of our inventory. Price does not include $199 dealer fee or appropriate sales tax for your area. TAG is COD. VIN#1GYEC63T53R291840, STK#291840.